The Maryland SuperTech And Truck Driving Championships is Saturday June 8,2013. If you entered the Maryland Super Tech And Truck Driving competition or know someone that will be participating, you should have vehicle laser alignment completed prior to the Maryland SuperTech And Truck Driving Championships event. What is vehicle laser alignment? It is a highly innovative way to perform alignment on truck parts such as wheel alignment. It is important to have vehicle laser alignment completed for your truck because proper vehicle laser alignment helps enhance truck performance. Wheel Mounted Laser Alignment. This type of laser wheel alignment is not as accurate as the chassis mounted lasers. For the utmost accuracy for wheel mounted laser alignment, the axle tube needs to be examined for straightness. 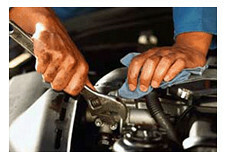 This task should be completed prior to checking the rear end placement or wheel alignment. The further the laser is from the wheel, the better laser alignment accuracy. Chassis Mounted Laser Alignment. This form of laser alignment has the wheel fixtures off and the laser on to make the chassis the master of the wheel. The chassis allows us to measure the straightness of the axle tube; the rear end placement and front tire rear alignment. In other words, the chassis mounted laser alignment method will reduce downtime on truck repairs because the chassis allows suspension adjustments to be completed with ease. Have your vehicle laser alignment completed by Middleton & Meads to keep your truck in top shape from the Port of Baltimore to the Maryland SuperTech And Truck Driving Championships. Poor wheel alignment makes truck engines work harder and fuel expenses go up as tires wear down fast. Have your fleets sent to Middleton & Meads for regular vehicle laser alignment services and other annual truck maintenance services. Middleton & Meads is here to reduce your carbon emissions, improve truck driver comfort by preventing the need for frequent steering fighting and make your fleets safer for towing heavy trailer loads. Learn about our mechanical repairs as well as more information on The June Maryland SuperTech And Truck Driving Championships today.